Send these establishments a message - its not ok to do this to any animal. We have many cases of Bernese rescued from a life of misery who undergo massive veterinary procedures to assist in physical recuperation from their previous life. These dogs are described as "pedigreed and much loved pets" but are in appalling and heartbreaking condition. These animals are contained in cages and show signs of neglect, mistreatment and abuse at the hands of disreputable breeders of mass production dogs. The only way to end this is to stop it from being profitable and viable to these establishments and educate the public to make an informed decision. Contact the BMDCV or Bernation for any further information. 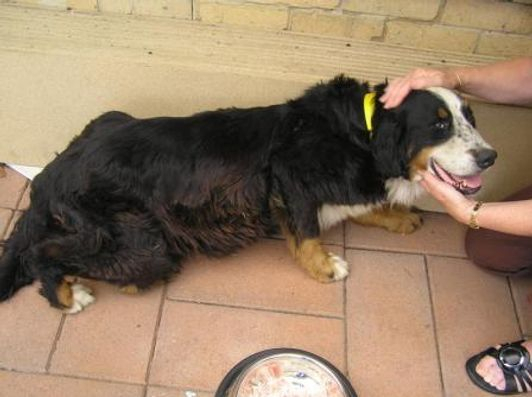 The Bernese Mountain Dog Club of Victoria has established the Guardian Angel Fund. This financially assists with the actual Rescue of Bernese Mountain Dogs in unfortunate circumstances. This fund covers rescue, veterinary attention, recuperation and rehabilitation. Once the dog has been assessed and is deemed suitable for rehoming, it will be available for trial to suitable homes. Permanent and fostering homes sought and any experience appreciated.